The 2016 election season is already in full swing. As voters in a number of states face new restrictions for the first time in a presidential election, we’ve already seen problems in primaries across the country. A new photo ID requirement led to long lines in Wisconsin. A reduction in polling places forced some to wait five hours to vote in Arizona. New rules created confusion in North Carolina. This could be an early glimpse of problems in November — as voters face the first presidential election in 50 years without the full protections of the Voting Rights Act, which was designed to prevent discrimination in voting. Against this backdrop, legislators are considering a variety of changes to their states’ voting laws. At the beginning of the 2016 legislative session, and as of March 25, 2016, at least 422 bills to enhance voting access were introduced or carried over in 41 states plus the District of Columbia. Meanwhile, at least 77 bills to restrict access to registration and voting have been introduced or carried over from the prior session in 28 states. Automatic voter registration has taken off across the country. Legislators in West Virginia  and Vermont  both passed groundbreaking bills with strong bipartisan support — West Virginia’s has already been enacted, and Vermont’s awaits the governor’s signature. This progress comes as Oregon, which passed  automatic voter registration in 2015, has reported substantial early success  with its new system. After just a few months, registration rates have increased nearly fourfold. California also passed a bill in late 2015, and supporters are looking forward to full implementation next year. For the fourth year in a row, bills that would expand voters’ access to the ballot box have outpaced those that would restrict voting, in terms of both introduction and passage. These bills, a number of which have bipartisan support, included efforts to modernize voter registration systems and restore voting rights to eligible citizens with past criminal convictions. Automatic voter registration is picking up speed and bipartisan support. The 2016 session saw more automatic voter registration bills introduced than any other kind of voting legislation. Under automatic registration, the government automatically and securely registers every eligible citizen who interacts with designated government offices unless the person declines to register. West Virginia passed an automatic voter registration bill, the first with significant bipartisan support, making it the third state after Oregon and California to adopt this reform. In Vermont, the final version of the bill passed nearly unanimously, and observers expect the measure to be signed into law soon. It is the second state to pass automatic registration with strong bipartisan support. Illinois may also still pass legislation in the current session. Illinois’ bill is exciting because it provides for automatic registration not only at DMVs but also at other agencies, like social service and disability offices, expanding the breadth of this reform to reach a wider array of eligible citizens. Although Maryland did not pass automatic voter registration, the state’s legislature passed  a broad voting reform bill, requiring all of the state’s voter registration agencies to transfer voter information electronically to state election officials. Doing so would add a key building block for future automatic registration in the state. The governor is expected to sign the bill, which enjoyed strong bipartisan support, into law. All in all, 28 states and the District of Columbia  have considered automatic registration this year (including legislation carried over from 2015 sessions). In addition, groups in several states, like Alaska , are pursuing ballot initiatives to adopt automatic registration. Online voter registration continues to advance in the states. At least 15 states considered online registration legislation. Idaho, Rhode Island, and Wisconsin (which also included restrictive elements discussed below) adopted the reform, and Tennessee  is also poised to pass it this session. Most states now offer some form of online voter registration . Rights restoration remains a popular reform. Restoration of voting rights to those with past criminal convictions was the second most popular type of reform this session after efforts to modernize registration, with 27 bills introduced in 15 states. Maryland’s  legislature overrode a gubernatorial veto to restore the rights of 40,000 Marylanders. And in Kentucky , a dispute continues over Gov. Matt Bevin’s suspension of an executive order restoring voting rights to those convicted of certain crimes. Legislation that would amend Kentucky’s constitution to automatically restore voting rights passed the state House by a wide margin and received substantial bipartisan support, but has stalled in the state Senate. States are passing fewer laws that restrict voting rights overall, but voter ID bills are still the most common type of restriction being introduced. The pace of states’ adoption of restrictive voting legislation continues to slow, perhaps because many states already have them on the books. Although voter ID bills are the most common form of restrictive legislation that has been introduced, other types of restrictions have gained traction. 19 states saw 37 voter ID bills introduced or carried over into the 2016 session. Legislators in Missouri  introduced a photo ID requirement, though it will require voter approval through a state constitutional amendment. The bill passed the state House and awaits a vote in the Senate. West Virginia passed a less restrictive voter ID requirement, but as part of legislation that included automatic registration, described above. On the brighter side, Florida made its law less restrictive, adding veterans’ health IDs, concealed-carry licenses, and government employee IDs to its list of photo ID forms accepted for voting, as long as those IDs were unexpired and contained the voter’s name and photograph. Two states passed laws that may limit voter mobilization. Arizona made it a felony for anyone other than a family/household member or caregiver of the voter to collect and submit the voter’s absentee ballot. In prior years, several states prescribed rules to limit third-party collection and delivery of absentee ballots. Arizona’s would be among the strictest, and may create significant barriers for minority or elderly communities, who historically have relied on absentee ballots and assistance from civic groups to cast their votes. In Wisconsin, the state eliminated “special registration deputies” — volunteers who were previously permitted to verify voters’ residency when they collected or submitted voter registration applications. The law threatens  the ability to civic groups to conduct voter registration drives in the state. New voting restrictions in place in 2016. Aside from new restrictions considered in 2016, there are 14 states  with voting restrictions in place for the first time in a presidential election this year. The new measures range from strict photo ID requirements to early voting cutbacks to registration restrictions. This is part of a broader movement to curtail voting rights, which began after the 2010 election, when state lawmakers nationwide started introducing hundreds of harsh measures making it harder to vote. 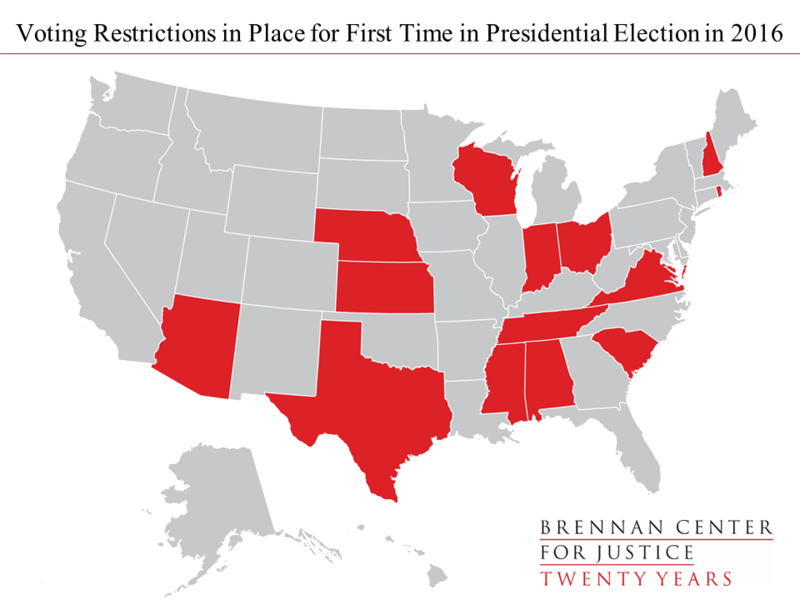 Overall, 20 states have new restrictions in effect since the 2010 midterm election.